My name is Kay. This is my very first blog. 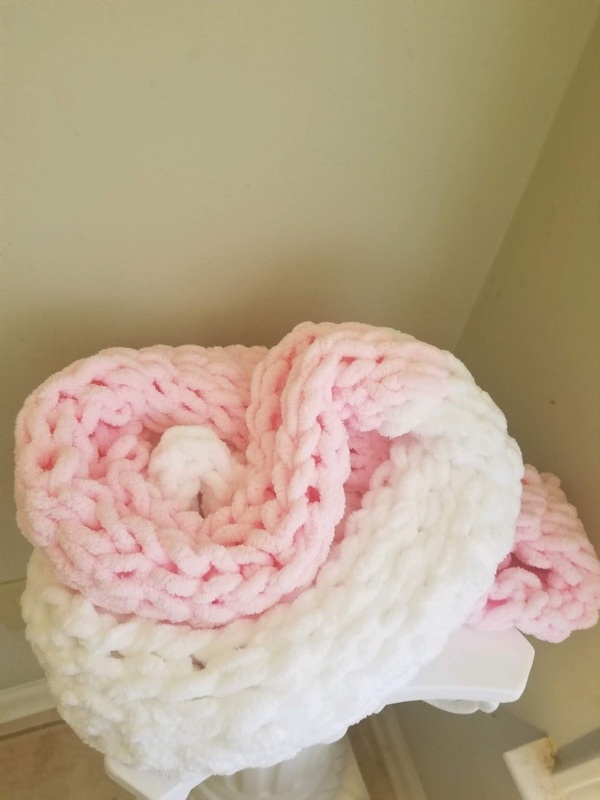 I am new to knitting and decided I would blog and record my progress as I work toward becoming an experienced knitter. I decided to knit because my mother has crocheted for as long as I can remember, and I wanted to follow in her footsteps. I hope to also pass this tradition on to my own daughter. I wanted my first project to be simple, easy, and fun. I thought what better way than to start by finger knitting, which embodies those three things. If you’re interested in learning how I made my first Scarf using Red Heart Loop it Yarn, please read the instructions below. You can also click on the video link posted below to see a tutorial. Just scroll to the bottom and click on the link. There will be video instructions where you can follow along with me as I go. 1) Clip the center of the first 3 loops of yarn create a longer tail. 2) Count out the first 10 loops that start from the tail. You can count out less loops if you want it smaller or more loops if you want it larger, however, the instructions will focus on a scarf consisting of 10 stitches. Continue inserting across the row until you have inserted loops into each of the original 10 loops. Make sure you don’t skip any loops, or you’ll have to start from the beginning. 4) When you get to the end of the row move to the next row and work back across to the other side by inserting loops into the loops that you just worked on. 5) Continue to insert loops into your work creating new rows. When you are done with the first ball if you want a longer scarf you will need to add a new ball of yarn by inserting the new loops into the loops from the first ball of yarn. 1) Clip approximately 5 loops to create a long tail. 2) Turn the scarf over and line the ends up together. 3) Insert the string through the first two loops and put a knot in it to keep it in place. 4) Insert the string in and out of the loops until you get all the way across as if you are sewing them together. 5) At the end add another knot and trim the tail off your work. Be careful not to cut the actual scarf. What an interesting tutorial. I love knitting. My mom was very talented in knitting. Would love to try this. Wow I wish I could do this! My nan use to always knit and she would always have to ‘start me off’ lol lol lol your tutorial looks very helpful maybe ill give it a go . I really wish I had the time and patience to knit anything. I love the craft and one day I just might just to say I accomplished something like this! These look so comfortable!! I have always wanted to be able to knit my own scarf, but never knew where to even start. I’ll definitely have to give this a try, thanks for sharing! This looks like such a fun material to work with! One day I might have to try it!